Steve Torrence has not yet won an NHRA Top Fuel event at his home track in Texas. 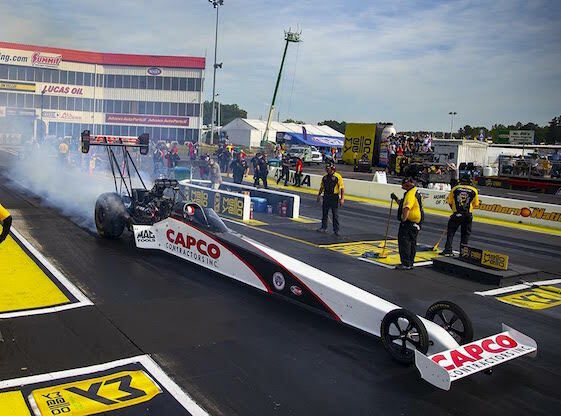 ENNIS, Texas – Native Texan Steve Torrence admittedly has returned to the Texas Motorplex with mixed emotions for this weekend’s 33rd annual AAA Texas NHRA FallNationals. Torrence openly loves the Motorplex, the all-concrete surface on which he has logged more laps than any other and where he won a pair of races en route to the 2005 Top Alcohol Dragster World Championship. However, the Kilgore, Texas, resident’s recent history at The Plex has been perplexing. One of only four tracks on the NHRA tour on which he hasn’t won in Top Fuel since turning pro, the Motorplex played a pivotal role last Oct. 15 in denying Torrence the title that would have made him the first NHRA driver to win championships in both the Fuel and Alcohol dragster divisions. The class point-leader then as he is now, Torrence drove his Torrence Racing dragster to the No. 1 qualifying position and seemed to have the race in-hand until he crossed the finish line after a second-round/left lane victory over Richie Crampton. That was when a rear tire blew out at more than 320 mph, dropping the left side of Torrence’s 10,000-horsepower hot rod to the ground and crashing into the concrete guard wall. The car’s front clip collapsed and detached from the driver’s section and rear wheels, which continued skidding across the track behind Crampton’s car before stopping. While Torrence emerged from the parts-spewing carnage with fists raised and without injury, it took a herculean team effort deliver him to the starting line in a backup car in time for the semifinals opposite Brittany Force. Torrence lost that round and things never were the same down the postseason stretch. Torrence’s won-lost record before the crash was 54-13. Afterward, it dipped to 2-3. Torrence’s big-mo is built upon consecutive wins to start the six-event Countdown to the Championship, first at Maple Grove Raceway in Reading, Pa., and at Gateway Motorsports Park in Madison, Ill., near St. Louis. Those were the category-leading sixth and seventh wins of the season for Torrence, who over the last two years has won 15 national events _ twice as many as any competitor in NHRA’s premier class. Still, racing at the Motorplex remains a daunting task. “I’ve made a lot of laps there in every race car I’ve driven, but it’s a double-edged sword for us,” Torrence said. “We get to see some people we don’t see too often and get to race with some friends that I grew up with in the Sportsman ranks so that’s pretty neat; something I always look forward to. On the other hand, we’re at a point where you really need to stay focused on racing. Brittany Force (Top Fuel), Robert Hight (Funny Car), Jason Line (Pro Stock) and Eddie Krawiec (Pro Stock Motorcycle) were last year’s winners of an event that will be televised on FOX Sports 1 (FS1) and FOX Sports 2 (FS2), including live final eliminations coverage on FS2 starting at 11 a.m. (CDT) on Sunday. The annual trip to former Funny Car driver Billy Meyer’s stadium-style facility in the Dallas/Fort Worth Metroplex is the halfway point of the six-race Countdown and the 21st of 24th races on the 2018 schedule. Although Steve is the face of Torrence Racing, the Kilgore College graduate is quick to credit a crew led by veteran tuner Richard Hogan, who is “off-restriction” after successfully undergoing a procedure to correct and irregular heartbeat last week at the Cleveland Clinic. Californian Force, of John Force Racing, emerged to win her first championship by 81 points/four rounds of racing _ passing Torrence on the last day of the 2017 season in Pomona, Calif. Force currently is tied with Scott Palmer in ninth, prompting Torrence to recalibrate the field for the remainder of the playoffs. Mello Yello Drag Racing Series qualifying will open with two rounds at 2:15 and 5:30 p.m. (CDT) on Friday. The final two rounds of time trials on Saturday are set for 1:15 and 4:30 p.m. The FallNats also will feature competition in the E3 Spark Plugs NHRA Pro Mod Drag Racing Series, which makes its 10th of 12 stops in 2018, as well as the NHRA Lucas Oil Drag Racing Series, showcasing future Sportsman stars. After Nitro qualifying, fans can watch the Lone Star Lightning Jet Dragster and the El Arabe Jet Car shake the grandstands. Jet cars are thrust-driven vehicles propelled by jet engines with pre-run flame shows. Those in attendance also will have the opportunity to interact with some of the biggest names in drag racing during the NHRA Legends Tour, including meet-and-greets, autograph sessions and a variety of activities. Legends scheduled to attend the FallNats include Shirley Muldowney, Richard Tharp and Billy Meyer. To purchase general admission or reserved seats, call 800-668-6775.Tickets also are available online at www.texasmotorplex.com. Children 12-and-under enter free in general admission areas with a paid adult. To honor the Salute to First Responders, military and first responders save 20 percent on general admission tickets at the gate. For more information, visit www.NHRA.com. Top Fuel _1. Steve Torrence, 2,346; 2. Clay Millican, 2,276; 3. Tony Schumacher, 2,225; 4. Leah Pritchett, 2,192; 5. Antron Brown, 2,169; 6. Doug Kalitta, 2,135; 7. Mike Salinas, 2,119; 8.Terry McMillen, 2,093; 9. (tie) Brittany Force, 2,085; Scott Palmer, 2,085. Funny Car _1. Robert Hight, 2,270; 2. J.R. Todd, 2,240; 3. Courtney Force, 2,200; 4. Tim Wilkerson, 2,196; 5. Ron Capps, 2,182; 6. Tommy Johnson Jr., 2,166; 7. Matt Hagan, 2,144; 8. John Force, 2,116; 9. Jack Beckman, 2,113; 10. Shawn Langdon, 2,086. Pro Stock _1. Tanner Gray, 2,296; 2. Vincent Nobile, 2,244; 3. Drew Skillman, 2,222; 4. Jeg Coughlin Jr., 2,215; 5. Greg Anderson, 2,206; 6. Erica Enders, 2,192; 7. Jason Line, 2,133; 8. Bo Butner, 2,120; 9. Deric Kramer, 2,104; 10. Chris McGaha, 2,064. Pro Stock Motorcycle _1. Matt Smith, 2,263; 2. LE Tonglet, 2,242; 3. Eddie Krawiec, 2,222; 4. Hector Arana Jr., 2,214; 5. Andrew Hines, 2,201; 6. Jerry Savoie, 2,154; 7. Angie Smith, 2,115; 8. Steve Johnson, 2,108; 9. Scotty Pollacheck, 2,094; 10. Angelle Sampey, 2,085.